As of late I have been, well, one could say a bit tardy in posting updates to this blog. Hopefully this post will rectify the situation for awhile. Its also taken me nearly a week to write this post, so two weeks ago is actually the 10th. Two weeks ago I was up at [Camp Elim](http://www.camp-elim.com/) (which I’ve been going to since I was about 3) for a training camp to help prepare me to be a counselor there this summer. It mostly consisted of word projects and training sessions to teach all the staff for the summer about sharing the gospel with a child, running the various activities (archery, canoeing, ropes course, etc. ), and preparing devotions to share with the campers each night. Unfortunately, I wasn’t able to stay the whole week and had to leave on thursday to get ready to go on our church’s mission trip to [Immanuel Mission](http://www.immanuelmission.org/) on the Navajo reservation in north-eastern Arizona. We left on Saturday and drove for about 13 hours down to the mission to get in around 10pm (that is one, long, cramped drive in an 18 passenger van). The next day we went to the small church on the mission compound (which more than doubled in attendance from our presence ðŸ˜› ), and then took a hike up onto a nearby mesa in the afternoon. That evening we went out to the house of the clan we would be doing VBS for, set up our tent, and played with the kids. The next four days (Monday through Thursday) we would work on projects in the morning, eat lunch around noon, and then work until around 2. We would then have free time until dinner, after which we would leave to go out to do VBS for the evening, and then get back around 9:30, have a group Bible study, and go to bed. On Thursday, we finished the work projects early and several of us went and climbed up a nearby mesa called Tese-se-aa, which has all sorts of Anasazi ruins and pottery shards on top of it. That night, we took the tent down again, and then on Friday we all drove to Lake Powell and spent the day tubing and water-skiing. That evening after we finished boating we drove to a nearby park and had a barbecue and debriefing session, and then drove back to the mission again. That night, some of us (several people were sick and wanted to go to bed) pulled an all-nighter. Finally, on Saturday we drove 13 hours back to Parker again, with one notable difference. 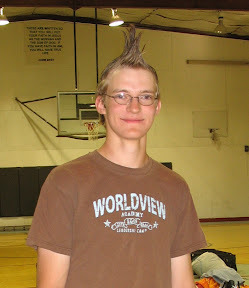 Most of the guys had mohawks ðŸ˜€ I had to use straight Elmer’s glue in mine to get it to stand up. So that’s what I’ve been up to lately, except for the mad programming I’ve done this week on our homeschool group’s new website.